The Women Advancing Africa (WAA) Forum launched this weekend in the Tanzanian capital Dar es Salaam with a call on women to take centre stage in Africa’s economic liberation. The forum is an initiative of the Graça Machel Trust and celebrates the critical role women play in development. It will also provide a platform to showcase women’s leadership and how that can be used for social change and economic transformation. Suzgo Chitete was at the launch. The platform’s launch attracted nearly 300 professional women from across Africa, representing business, politics, law, civil society, and media. Speakers at the forum said that the political liberation achieved decades ago is not good enough for Africa to move forward, and therefore there was a push for what they are calling the ‘second liberation’ – with a focus on making the continent economically independent. Speaking at the inauguration ceremony, Graça Machel said the forum will help to establish networks among women in the region with a common interest in developing their countries using pan-African ideas. “Our networks are rooted in each country where we are represented. We believe that any social, cultural and economic transformation has to be driven by women in the context of the country they belong to, but a country alone is not enough. Hence, we encourage sub-regional cooperation,” explained Machel. She said the choice of Tanzania as the host of the event was deliberate, as the country was a sanctuary of early African liberation struggles. Machel said the delegates came to Tanzania to pay respect to the East African country’s role in achieving African liberation, and to embark on a second liberation which will set the continent on a path to economic independence, with women as central drivers of change. 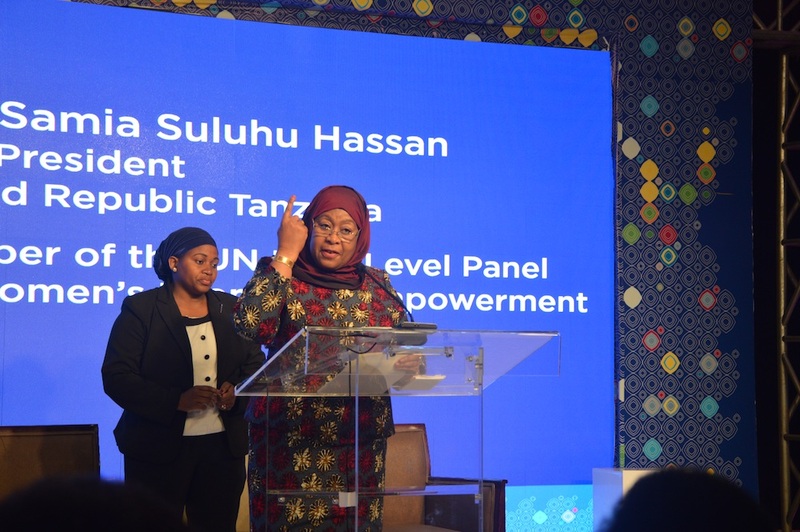 In her opening address at the conference, Tanzanian vice-president, Samia Suluhu Hassan, commended the initiative saying ideas shared there could help inform policies and bring about gender parity. She agreed with other speakers that it would be a mistake to ignore women in pushing forward Africa’s transformation agenda. The Tanzanian deputy leader, who is also a member of the UN High Level Panel on Women’s Economic Empowerment, made a personal commitment to support women in her country in any way to ensure their effective participation in the WAA forum. “Governments should provide an enabling infrastructure which seeks to promote gender parity. May I also call upon all of us here to ask our governments to take into account the implementation of [the United Nations’] sustainable development goals for faster realisation of economic empowerment, especially for women,” Hassan said. The four-day event hosted several specialised discussions covering topics like agribusiness, energy and extractive industries, cross-border trade, financial inclusion, technology, and media in the context of changing the narrative on women’s representation. The discussions highlighted varied opinions, with some participants blaming men for monopolising power during the independence movement, thereby marginalising women. Other participants felt lessons could be drawn from the first stage of political liberation to succeed in the second struggle for economic independence. Appearing on a conference panel, Hadeel Ibrahim, the executive director of the Mo Ibrahim Foundation, stressed that the second liberation struggle needs to have an inclusive feminist agenda. “The first liberation was about gaining power while the second one is about empowerment. This liberation should aim at inclusiveness for marginalised groups while adhering to good governance, where everyone is treated with dignity regardless of gender,” said Ebrahim. The former president of the Pan-African Parliament, Gertrude Mongella, thinks that independence was achieved due to unity of purpose among nations, and that same spirit of unity should help to make the second liberation a success. Male speakers at the forum also supported women taking a driving seat in the economic transformation of Africa. “Studies have shown that investing in women has economic benefits because the global GDP can expand by $12 trillion. In sub-Saharan Africa alone, the GDP can expand by $300 billion, which is three times the amount of foreign aid to the continent,” explained Sangu Delle, a Ghanaian entrepreneur and chief executive officer of the Golden Palm Investments Corporation.